Created by British Aerospace, the Hawker 800XP is a generation three model of the 800 series; similar to the Hawker 400XP. Excellent for short and long range travel, the Hawker 800XP has transformed over the years with subtle, but important upgrades that allow for overall improved qualities and performance capabilities. Its cabin holds up to eight passengers with seats that can move to anyone’s comfort needs. With low noise levels and a large cabin, the Hawker 800XP can hold passengers comfortably with 48 cubic feet to house luggage. With two engines, this aircraft is capable of taking off with over 4,500 pounds of thrust. The Hawker 800XP can make it to almost 40,000 feet in just twenty minutes, ultimately reaching an amazing speed of nearly 450 knots. If needed, the aircraft can also travel between 22,000 and 41,000 feet. Another positive feature of the Hawker 800XP is its capability to take off with little runway area. System features of the Hawker 800XP include GPS, High Frequency communications, GPWS, TCAS II, and dual autopilot. Pairing these features with fuel efficiency, exceptional performance, and above-standard capabilities, the Hawker 800XP is absolutely a competitor among the most advanced aircraft of today. The Hawker 800XP is one of the true workhorses of private jet charter. A more recent production model of the 800 series Hawker jet, it was first introduced in 1995. While it may appear identical to the original 800, the XP has new engines which increase its range. The 800XP is recognizable by its low, swept wing with twin rear fuselage mounted engines. It has a highly swept tailplane with high-mounted horizontal stabilizer. Each side of the fuselage has 6 cabin windows, while the fuselage itself holds up to 8 passengers and a 2 man flight crew. 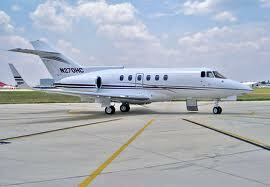 The Hawker 800XP cruises at 461 knots and has a range of 2955 nautical miles. The Hawker 800XP is one of the most versatile mid-size aircraft available, providing a combination of value, utility, safety, and comfort that make it one of the most popular private jets.